As days are getting shorter and darkness is omnipresent at after work training sessions, we need to reconsider our training plans for the winter season (wish I could head South - well, better West and then South: Florida, here I come!!!). Further, temperatures below zero, rain, snow and whatever else nice there is in Austrian winter will force us to do something beyond riding on days where the footing simply does not allow riding lessons. 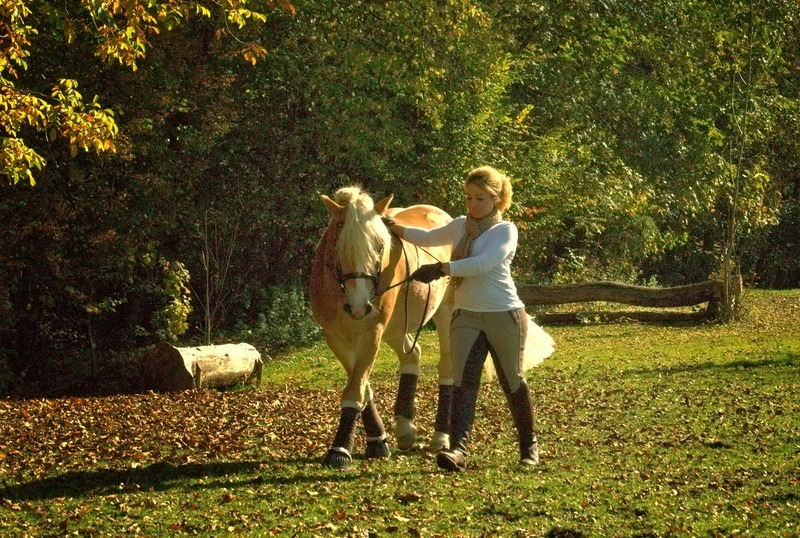 In my month in the Netherlands, I already learned to lunge the classical way, work in hand and free work a horse. This is the basis of my winter training plan for Hafl this year. There are hundreds of videos on youtube when searching for: Abkauübungen! Another thing that I love to do is let him cross his legs on a circle (more or less leg yielding) or only crossing his haunches (turn on the front legs). That relaxes his hips and let him step under with his hind legs better. Lungeing: As I learned in the Netherlands, I am now lungeing the classical way. That is so to speak completely different from lungeing as I used to do it. I am moving along with the horse, using my body language more than a whip and having the horse on a caveson without aid reins. Spiral in and spiral out are some exercises that I use especially in canter to increase Hafl's strength in the haunches. What does not work for us yet is direct transitions. But that is something to work on the next months. Using poles is another way to make lungeing exciting and diversified. Freework (different from Liberty): When I freework Hafl, there is more distance between us than it is in liberty. It is rather moving like being lunged without lunge line. With my body language, I try to control gaits, tempo, rein changes and get the full attention of my horse. As we have a very small indoor only, this even works there as you do not need that much of space. I start with simply exercises like walk, trot then transitions and tempi changes as well as (if there was enough space and attention) flying changes in canter. Freeworking is not only about controlling your body language, it is more about energy and energy flows and being concentrated on what you do. So freeworking is way more then simply let your horse run around and make him get tired. So, every training week should be comprised of these five elements. Sometimes, one day consists of not only one of these for me. I still try to keep the two days break rule saying that he only needs to work five times a week. There are exceptions as they might not be allowed to go out these days, so I try at least to give him a chance every day to walk around for some time. First attempt was to have a ready plan for a week, but due to unforeseen longer work hours or rain or whatever that did not work so I try to make a plan only when I am on the way to the barn.